Professor Florian Siegert of the GeoBioCenter, founder of Remote Sensing Solutions (RSS) in Baiersbrunn, has won the Indonesia Peat Prize (worth 1 million euros), together with the other members of the International Peat Mapping Team. 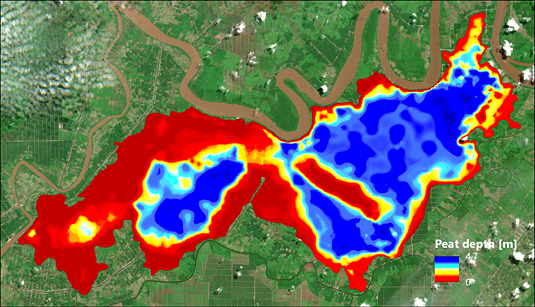 This image, acquired during one of the mapping exercises, shows the extent and the depth of a peat dome. The International Peat Mapping Team (IPMT) is made up of members of Florian Siegert’s group, Dutch researchers, and experts based at the Indonesian Agency for the Assessment and Application of Technology (BPPT) and Sriwijaya University in Indonesia. The IPMT has now received the Indonesia Peat Prize for the development of a procedure that can precisely determine the distribution of peat in the country. The Indonesian Government intends to use the data obtained with the new method in its efforts to protect and improve the management of the country’s extensive wetlands. In light of the fact that uncontrolled fires in Indonesia’s peatlands accounted for 42% of the country’s carbon dioxide emissions in 2015, this is an urgent and challenging task. Studies have shown that the resulting rise in levels of air pollution accounts for the premature deaths of 100,000 people. The wildfires in 2015 resulted in economic losses amounting to 16 billion US dollars, and released over 1.5 million tons of CO2, equivalent to the quantity emitted by 350,000 cars. One of the many factors that increase the risk of wildfires is the ongoing drainage of tropical wetlands. The mapping procedure developed by the IPMT researchers combines satellite-based remote sensing with aerial surveys and ground-based measurements to determine the distribution and depth of peat. The results were then checked on the ground. The precision of the data obtained with the IPMT’s methodology was the primary reason for the jury’s decision to award the Indonesia Peat Prize to the team. In all, 44 international research groups took part in the competition, which was held over a period of 2 years, during which many mapping exercises were carried out. “We are delighted by the announcement,” says Professor Siegert. He attributes the team’s success primarily to the wide-ranging expertise of its members, whose research has focused on the systematic investigation of tropical peatlands since the early 1990s. He now hopes to strengthen the links between the participating universities. He points out that several research projects carried out at LMU‘s GeoBioCenter contributed directly to the design of the prize-winning technology. He intends to use the prize money for further work in this field at the University.